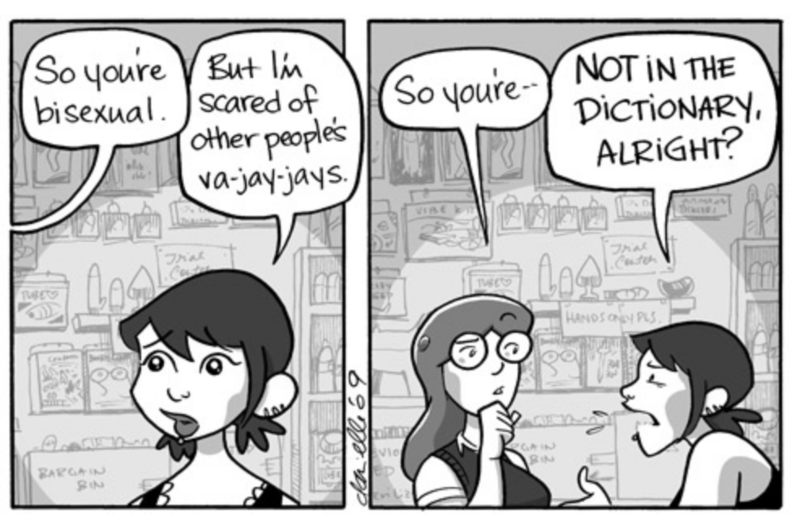 Of course, this campaign has also long been a feature of webcomics: some of the greatest comic art on the web has either been created by LGBTQI artists/writers, and the themes of acceptance and tolerance, and deep explorations of sexuality and gender are common on the digital page. Below are only a few examples amongst dozens of webcomics which have elegantly and eloquently presented these issues to their audiences. Marten’s character arc clearly takes him through the same sort of journey the new Queer Eye program also intends to take it’s viewers on, beginning with his inherent tolerance and building that up to his total acceptance of his current girlfriend’s gender identity. 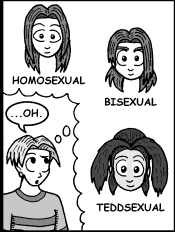 And he’s not alone in the comic: Jacques introduced his first Queer character, Tai the librarian, in 2006 and shortly thereafter Dora Bianchi identified as bisexual (2007). Most recently, the narrative of the comic has shifted away from Marten in favour of Faye, a longtime character who is slowly but surely exploring her feelings for her closest friend and roommate, Bubbles the (female) robot. 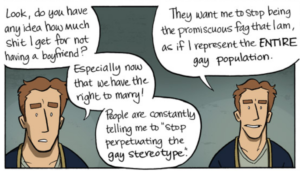 Jacques clearly intends to explore the development of these nascent feelings into the future, so the comic is definitely worth keeping a (queer) eye on in months to come. Another powerhouse of the webcomics world, Corsetto’s strip about the eponymous girls – Hazel and Jamie – and their supporting cast of characters across the whole range of the gender spectrum has long been the gold standard for queer representation in the webcomic world. Corsetto is particularly notable for highlighting gender identities that don’t often get represented in media, such as Asexuality and… whatever Jamie is comfortable calling herself. The character of Jamie is also used to explore non-traditional relationships such as when her long-term partnering with Asexual girlfriend Erin expanded into polyamory. 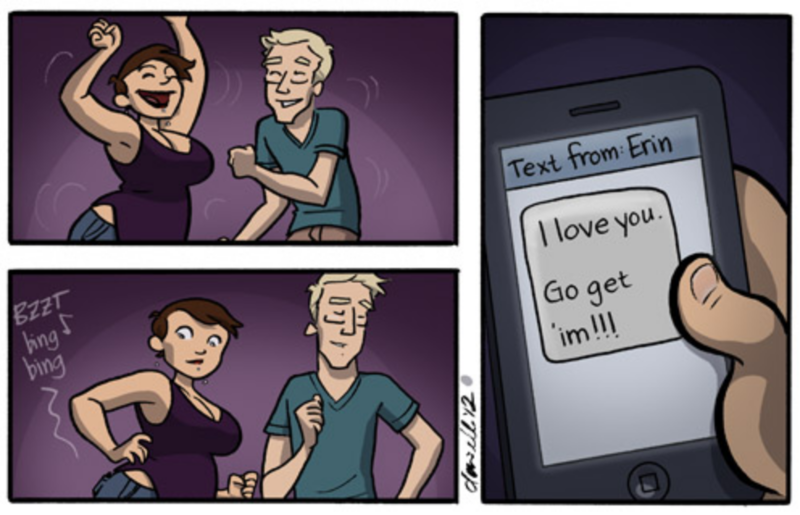 Whilst the development is certainly used to drive drama in the story, the conflict is centered on personal acceptance of change, rather than moralising on the premise of polyamory itself – which is instead presented as simply one of many relationship options available to the characters of the comic. Corsetto’s normalisation of non-cis and non-traditional relationships also extends to more represented queer relationships, turning the lens on the way that acceptance can bring with it new and continuing challenges. 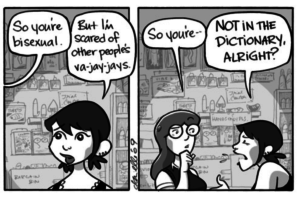 Although the comic wrapped up in 2015, the challenges and experiences of it’s cast remain as relevant as ever – and the re-release of the strip’s initial comics (now colourised) with updated commentary underneath mean those initial explorations of gender and sexuality are being revisited and re-contextualised for the modern era. 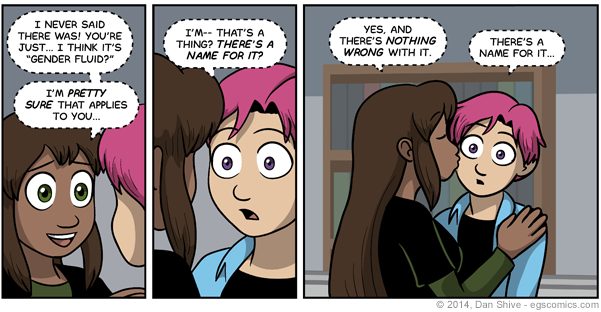 Because if you know one thing by now, it’s that I can’t go an update without referencing EGS at least once! 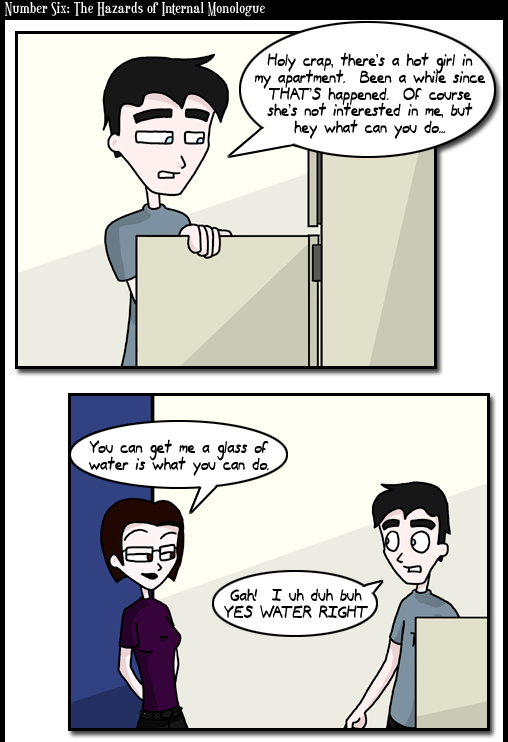 As another one of the longest-running webcomics on the ‘net (it only beats out Digital Strips by a couple of years! ), this comic is a fifteen-year exploration of gender and sexuality, and includes characters who identify as straight, homosexual, bisexual, asexual and pansexual – plus a category or two of it’s own. 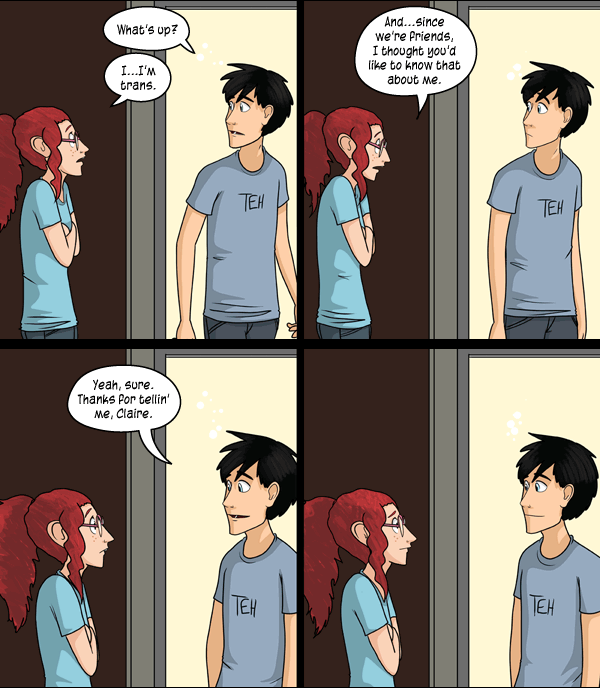 Shive’s characterisation of Tedd as gender-fluid is important, as this is a particularly under-represented identity amidst historically marginalised individuals. Even as television shows such as Queer Eye and web media like the comics presented above normalise and explore gender and sexuality, there is a habit and an attraction for this exploration to fall back on the more common of these expressions – particularly if the character is central to the narrative and therefore needs to connect with the audience. EGS‘s unflinching determination to bring the whole spectrum of gender and sexuality into the spotlight via its main characters earns it a place on the forefront of promoting tolerance and acceptance for all individuals, through the Webcomics medium. 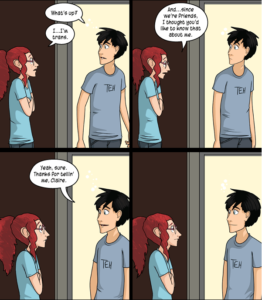 What other webcomics do you know which deal with issues of gender and sexuality? Let us know in the comments below or by reaching out on Twitter – and keep an eye on the site over the next couple of weeks; with the BIG ONE, episode 500 of Digital Strips coming up, there’s never been a better time to get stuck into some great webcomic content here and on the podcast – and remember, as always: don’t eat the clickbait! This entry was posted in Editorial and tagged dan shive, danielle corsetto, el goonish shive, girls with slingshots, jeph jacques, LGBTQI, LGBTQI comics, netflix, Queer comics, Queer Eye, Queer Eye for the Straight Guy, Queer Webcomics, questionable content by The Average Joe. Bookmark the permalink.